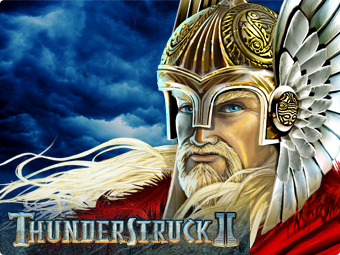 Thunderstruck II is the second game in Microgaming’s Thunderstruck series of Norse mythology themed pokies. The original was such as success that it only seemed natural that this second title would be developed. It is quite a few years old now, but that hasn’t stopped it from still being popular today. Like its predecessor, it mashes high playing card icons with your favourite Norse Gods as paying symbols on the reels. Microgaming’s Thunderstruck II is one of their very first 243 ways to win pokies, meaning that there are 243 paylines spread over the 5 reels of the game. Thunderstruck II will permit players to choose coin sizes of 0.01 up to 0.05, whilst allowing them to stake up to 10 of these per spin. Ultimately this means that Thunderstruck II is going to cost you anything from 0.30 per spin, up to 15.00 per spin, since you cannot mess with the number of lines in this non-progressive pokie. Play at Guts With $400 + 100 Free Spins! Play Now! Wild symbol: Thunderstruck II uses its own logo as a wild symbol. When this icon appears, it can replace all other symbols in the game – barring the scatter – with one that you need to win. It cannot appear during the Wildstorm feature, though. Wildstorm feature: At any point in the game, the Wildstorm feature may be randomly triggered. When it is, it has the ability to turn up to 5 reels wild at once. 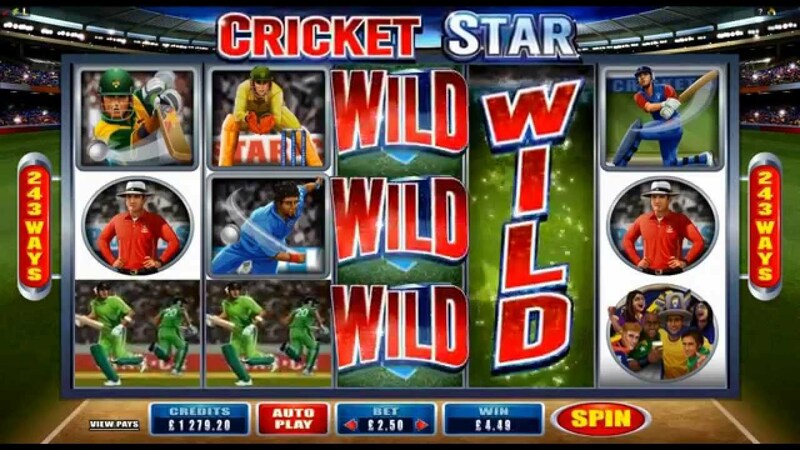 Free spins cannot be triggered during the Wildstorm feature. Scatter icon: The scatter icon is represented by Mjölnir (Thor’s Hammer), and it needs to appear 3, 4 or 5 times anywhere on the reels to grant a player access to the free spins bonus round, which is known the Great Hall of Spins. 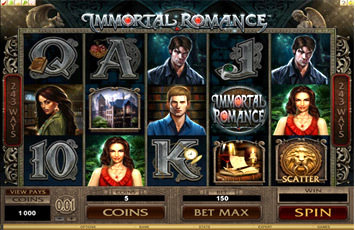 Free spins: The more times you enter the Great Hall of Spins, the better the bonuses become. The very first time you enter the bonus, you’ll receive Valkyrie’s bonus, which consists of 10 free spins with a 5x multiplier. Enter a fifth time, and you’ll land Loki’s bonus of 15 free games, with a Wild Magic feature on the third reel, which transform random symbols in extra wilds. Odin’s bonus is available the tenth time you enter the bonus, where you can pocket 20 free spins with a Wild Raven feature, which turns random symbols into 2x and 3x multipliers. Finally, enter a fifteenth time to claim the Thor bonus, which promises 25 free spins with a Rolling Reels multiplier feature. Thunderstruck II is a non-progressive jackpot pokie, although you can still win up to 1,000 coins on a payline, by landing 5 wild symbols. 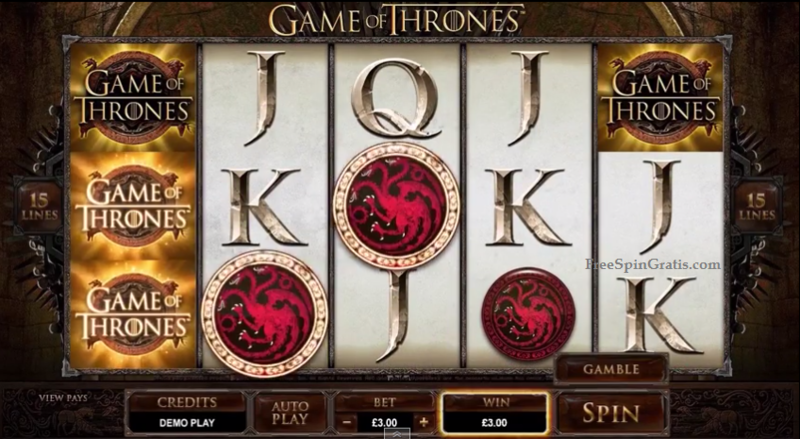 Actually, given the number of paylines present, if you were to play on the maximum wager and land wilds across all of the reels in every position, you could win as much as 2,400,000 coins. 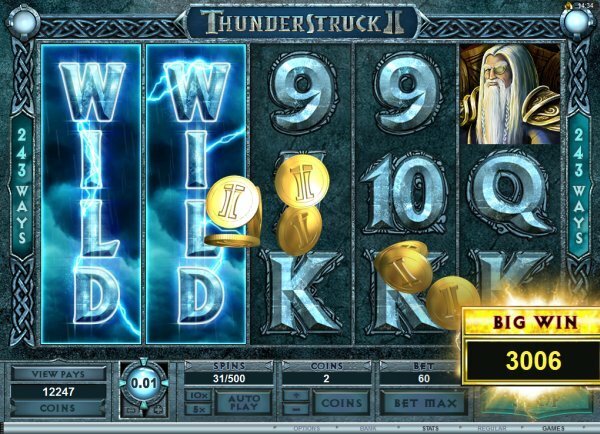 Thunderstruck II is a legendary online video pokie, and one which every Microgaming fan must try their hand at, at some time or another. It has so many good features that it is impossible not to love this superb game. Unlike many other pokies it has also aged well, so it can be found across the net even today.